Bertman, Jennifer Chambliss. The Unbreakable Code. Henry Holt & Company, 2017. Emily and James have hardly recovered from their adventures in Book Scavenger, and now they notice their teacher Mr. Quisling acting suspiciously. Following him leads to another book-related mystery. Can they solve this mystery before the mysterious arsonist beats them to the answer? 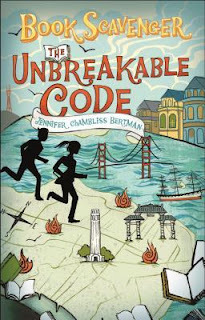 This book was very similar to Book Scavenger, a book I very much enjoyed and frequently promote at my library through book talks. While there are plenty of references to books in this story, is not nearly as literature or library-focused as Escape From Mr. Lemoncello's Library or its sequel. I loved watching the kids solve the puzzles and wondering if they'd arrive at the correct conclusion before the bad guys caught up with them. I did guess the ending correctly, but I'm not an 8-12 year old, so I don't consider that a bad thing. Full of San Francisco color and history, this book is highly recommended for tweens, particularly those who are fans of mystery stories. 5, 4, 3, 2, 1 ... Blastoff!